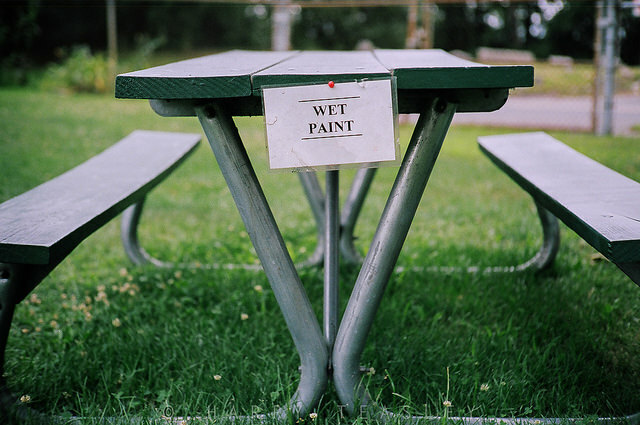 How many times have you seen that and wanted to touch the wet paint? How many times have you seen that sign, ignored it, and done the thing you have been explicitly told not to do? Do not think of a blue tree. Did you think of the blue tree? You thought of the tree, did not you! Even though I specifically told you not to think of a blue tree—that is what you did. Psychologically, what do you think happens when you say these things? Your mind latches onto messing up, being an idiot, being a failure. The unconscious mind cannot handle the word “don’t.” The concept “doesn’t” compute. The math “doesn’t” make sense. When you say “I don’t want to fail,” you’re giving your brain nearly infinite ideas to ponder over. Because your brain cannot possibly comprehend all of these possibilities, it focuses on the one thing you have given it: failing. You end up focusing on the one thing you did not want to focus on. When you do not want to think of a blue true, you end up thinking about a blue tree because “infinity minus one” possibilities is too many to handle. You are setting yourself up for failure. You are directly undermining your intention. Yikes. On the other hand, when you want to think of a blue true, it is easy to call it to mind. You choose to think of something you want. You choose to be specific over being abstract. If you live your life saying “I don’t want” you will be thinking a lot about all the things you do not want, which is exactly what you will end up with. If you live your life saying “I want,” you will be thinking about all the specific things you do want, and that is exactly what you will end up with. But do not believe me.